1. What is the primary energy source of living organisms on earth? The sun, the center of our planetary system and a star in the Milky Way galaxy (our galaxy), is the source of the energy processed and consumed by living organisms. Intense nuclear reactions in the sun release light and other energy radiation into the surrounding space. Some of this energy reaches our planet. 2. How is light from the sun transformed into the chemical energy used by living organisms on earth? Light from the sun is transformed into chemical energy contained in organic material through the process of photosynthesis. In photosynthesis, light, water and carbon dioxide react and highly energetic glucose molecules and molecular oxygen are produced. 3. What is the chemical equation for photosynthesis? 4. What living organisms are responsible for photosynthesis? What cell organelle is responsible for the absorption of light in the photosynthesis process in plants and algae? There are many organisms (including all animals) that do not use photosynthesis. There are also autotrophic organisms that do not perform photosynthesis but which do perform chemosynthesis. Plants, algae and cyanobacteria are photosynthetic organisms. In plants and algae, light is absorbed by chlorophyll, a molecule present in cytoplasmic organelles called chloroplasts. 5. Are there chloroplasts in cyanobacteria? In cyanobacteria, there are no chloroplasts and chlorophyll layers are dispersed in the cytosol. 6. Which chemical element is at the center of the chlorophyll molecule? The chemical element at the center of the chlorophyll molecule is magnesium. One atom of magnesium is present at the center of a combination of eight nitrogen-containing carbon rings. 7. How do chloroplasts multiply? Like mitochondria, chloroplasts have their own DNA, RNA and ribosomes and self-replicate through binary division. 8. What evidence is there to support the hypothesis that chloroplasts and mitochondria were primitive prokaryotes that developed a relationship of mutualism with primitive anaerobic eukaryotic cells? This hypothesis is known as the endosymbiotic hypothesis, and discusses the evolutionary origin of mitochondria and chloroplasts. Mutualism is explained as the following in this context: mitochondria and chloroplasts can offer energy and nutrients to the cell in exchange for protection. This hypothesis is based on the fact that those organelles have their own DNA, RNA and protein synthesis machinery and divide themselves through binary division like bacteria. 9. What are the main structures of chloroplasts? 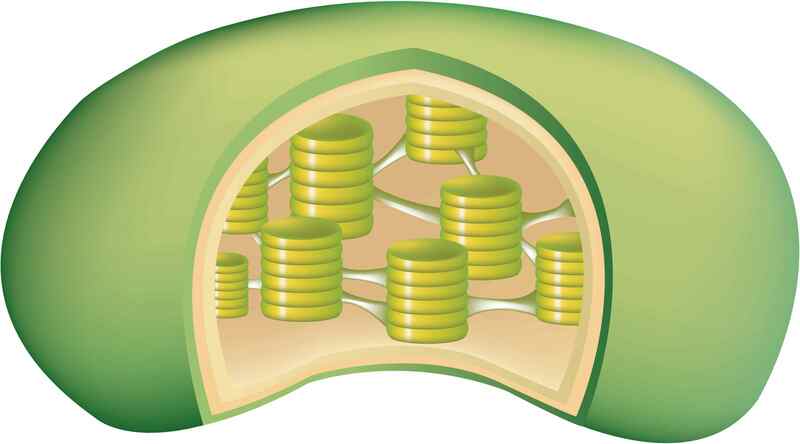 Chloroplasts are made up of two membrane layers, the outer and the inner membranes. Inside the organelle, the basic unit is called the granum, and is a coin-shaped structure that, when combined with other grana, forms structures called thylakoids. Thylakoids fill the chloroplast and an intergrana membrane permeates the interior of the organelle. 10. In which chloroplast structure are chlorophyll molecules found? Chlorophyll molecules are distributed in an organized manner in order to enhance the exposure of thylakoid surfaces to light. 11. What do ATP and ADP mean? What are the roles of these molecules in the energy metabolism of a cell? ATP is the abbreviation of adenosine triphosphate, a molecule made of one adenosine molecule bound to three inorganic phosphate ions. ADP is an abbreviation of adenosine diphosphate, which is two molecules of phosphate bound to one molecule of adenosine. ATP stores energy for the cell. When ATP hydrolyzes and becomes ADP, energy is released and then consumed by several metabolic reactions. 12. What is ADP phosphorylation? What are photophosphorylation and oxidative phosphorylation? ADP phosphorylation is the addition of one inorganic phosphate molecule to the adenosine diphosphate molecule, thus creating ATP (adenosine triphosphate) and incorporating energy. The phosphorylation is oxidative when the energy incorporated comes from the breaking down of organic molecules with oxygen as reagent, like in aerobic cellular respiration. The reaction is called photophosphorylation when the energy source is light, like in photosynthesis. The energy incorporated into ATP is disposable (released) to other cellular reactions when ATP hydrolyzes and ADP is formed again. 13. What are the stages of photosynthesis? Photosynthesis is divided into the photochemical stage, or light reactions, and the chemical stage. 14. What are the processes that occur during the photochemical stage of photosynthesis? The photolysis of water, the release of molecular oxygen, and the photophosphorylation of ADP, and the resulting of ATP and NADPH are the processes that occur during the photochemical stage of photosynthesis. 15. How is the light energy absorbed by chlorophyll transferred to ATP molecules during photophosphorylation? How is the resulting ATP used? Light excites chlorophyll and energizes electrons that jump off the molecule. The energy released when these electrons escape is used in the phosphorylation of ADP, forming ATP. The enzyme that catalyzes the reaction is ATP synthase. The resulting ATP is then consumed during the next chemical stage of photosynthesis to transfer energy to carbon dioxide for the formation of glucose. 16. Is it correct to consider the breaking down of water through the action of light the basis of photosynthesis? Besides ADP photophosphorylation, light energy is also responsible for the breaking down of water molecules during photosynthesis through a process known as water photolysis. During this reaction, water molecules are exposed to light energy and release protons (hydrogen ions), highly energetic electrons and molecular oxygen (O₂). Later, the hydrogen atoms bind to carbon dioxide molecules to form glucose. Since water is the hydrogen donor for photosynthesis, it is correct to say that water photolysis is the basis of the process. 17. What chemical substances are produced by water photolysis? What is the purpose of each of those substances? Free electrons, hydrogen ions and molecular oxygen are released during water photolysis. The electrons replace those electrons lost by chlorophyll molecules during photophosphorylation. The hydrogen ions are incorporated into hydrogen acceptor molecules (NADP) and later will be used in the synthesis of glucose during the chemical stage. Molecular oxygen is released into the atmosphere. 18. In sulfur photosynthetic bacteria, what molecule donates hydrogen for photosynthesis? 19. Why people say that that during photosynthesis carbon dioxide is enriched by hydrogen atoms from water to form glucose? During photosynthesis, carbon dioxide is energetically enriched by hydrogen obtained from water. Water broken down by photolysis is the hydrogen donor of the reaction. Glucose is made of carbon and oxygen atoms obtained from carbon dioxide as well as hydrogen atoms obtained from water. 20. What is the complete chemical equation for photosynthesis? 21. What is an example of a lab experiment that shows the variation in the efficiency of photosynthesis as a function of the different frequencies of light energy to which the reaction is exposed? Do you think that the green light frequency will be favorable to the reaction? The experiment: Plants of same species and ages are each placed under (respecting their photoperiods) light sources emitting only one of the colors of the light spectrum (violet, indigo, blue, green, yellow and red). The experiment is carried out with each of the colors and, after days, each plant's development is compared. The plants whose development was normal performed satisfactory photosynthesis while those with abnormal development underused the light. Chlorophyll is green because it reflects the green light frequency, meaning that it does not “use” the green range of the electromagnetic spectrum. Therefore, green light does not favor photosynthesis (strangely, green is the range of the light spectrum that plants “dislike”). 22. What are the divisions of white light according to the electromagnetic spectrum? Which are the two most efficient colors for photosynthesis? The color divisions of the electromagnetic spectrum in decreasing order of frequency are: red, orange, yellow, green, blue, indigo and violet. When mixed together, these colors generate white. It has been confirmed via experiments that the most useful colors for photosynthesis are blue and red. 23. What are NADP and NADPH? NADP is the abbreviation for nicotinamide adenine dinucleotide phosphate cation, a hydrogen acceptor. NADPH is produced when NADP binds to one hydrogen atom. It is the form that transports hydrogen. 24. Photosynthesis is the most important producer of molecular oxygen (O₂) on our planet. Which molecule do oxygen atoms released by photosynthesis come from? Which other molecule could you suspect they come from? Where do these oxygen atoms end up? The oxygen atoms released as molecular oxygen through photosynthesis come from water. It is easy to imagine that those oxygen atoms come from carbon dioxide. However, oxygen atoms from carbon dioxide are incorporated into glucose molecules and the water molecules released in the chemical stage of photosynthesis. 25. Where do the photochemical and the chemical stages of photosynthesis occur? The photochemical stage of photosynthesis occurs mainly in the thylakoids (the green part) and the chemical stage occurs in the stroma (the colorless framework) of the chloroplasts. 26. Which byproducts of the photochemical stage are essential for the chemical stage of photosynthesis? The chemical stage of photosynthesis depends on NADPH and ATP produced through “light reactions” (the photochemical stage). 27. What are the roles of NADPH and ATP during the chemical stage of photosynthesis? NADPH acts as a reductant of carbon dioxide, delivering highly energetic hydrogen atoms to precursor molecules during the glucose formation process. ATP is an energy source for the reactions of the chemical stage. 28. Why is the nickname “dark reactions” not entirely correct for the chemical stage of photosynthesis? “Dark reactions” is not a correct name for the chemical stage of photosynthesis since the reactions of the chemical stage also occur in the presence of light. 29. What is the general chemical equation for photosynthesis? Why doesn't this equation clearly show the real origin of the molecular oxygen released? Water molecules are present on the reagent side as well on the product side of the equation. However, the pure mathematical simplification of stoichiometric coefficients leads to elimination of water from the product side, making it appear that 6 molecules of oxygen (O₂), that is, 12 atoms of oxygen, are made from the 6 molecules of water, that is, 6 oxygen atoms, in the reagent side. As a result, the false impression that 6 other oxygens atoms come from the carbon dioxide is created. 30. What are the three main limiting factors of photosynthesis? The three main limiting factors of photosynthesis are light intensity, carbon dioxide concentration and temperature. 31. The rate at which photosynthesis takes place varies depending on the intensity of light energy. Does the same occur in aerobic respiration? What is the effect of these variations on glucose balance? In a photosynthetic organism, the rate of aerobic respiration can be superior, inferior or equal to the rate of photosynthesis. The rate of respiration depends on the energy needs of the plant while the rate of photosynthesis varies depending on the availability of light energy, if all other conditions are maintained the same. In a situation in which the respiration rate is greater than the photosynthesis rate, glucose consumption is higher than glucose production. In a situation in which the respiration rate is lower than the photosynthesis rate, glucose is accumulated (positive balance). In a situation in which the rates are equal, all molecular oxygen produced by photosynthesis is used in respiration and all carbon dioxide released through respiration is consumed by photosynthesis. As a result, there is no positive balance of glucose or depletion of carbohydrate stores. 32. What is the compensation point? What is the importance of the compensation point for plant growth? The (light) compensation point is the light energy intensity under which the aerobic respiration rate equals the photosynthesis rate. In this situation, all glucose produced is consumed and there is no incorporation of material into the plant. As a result, the plant stops growing. 33. Why is carbon dioxide concentration a limiting factor in photosynthesis? When carbon dioxide concentration is increased indefinitely, is photosynthesis also increased indefinitely? The availability of carbon dioxide is a limiting factor for photosynthesis because this gas is a reagent of the reaction. Since enzymes catalyze the formation of organic molecules with carbon atoms from carbon dioxide, photosynthesis stops as soon as these enzymes become saturated, that is, when all their activation centers are bound to their substrates. In this situation, an increase in carbon dioxide concentration will not increase the photosynthesis rate. 34. Why do some trees lose their green color in the autumn? In autumn, the days become shorter and nights become longer; as a result, there is a reduction in the photosynthesis rate. Because of this, some plants prepare themselves for the winter by making nutrient stores. In this process, nutrients from the leaves travel to storage sites: branches, the trunk and roots. With less chlorophyll produced in leaves, the typical green color of the plant fades. Study the next subject: go to Cell Respiration.